Things were going great. You had napping down, eating down, behavior down, etc. It was fabulous. Now, your child is waking early from every nap. Or your child is throwing a tantrum at every turn. What went wrong!?!?! One of the first things I try to figure out when something like this happens is what is different. What has changed? If it is sleeping, what has changed? Is the weather colder? Warmer? Have things been noiser at home? Is the sun rising earlier? Is exercise more or less? Is baby sick? Are there new teeth? Have new foods been introduced? Are new skills being developed? Is exercise level different? How are things today different from how they were when sleep was good? For the “sudden” tantrums, I do the same thing. What has changed? Are naps consistent? Is independent playtime in place? Is bedtime consistent? Have the days been more stimulating? I recently needed to go through this with Kaitlyn. She suddenly started being whiney and really emotional. Whenever I think the word “suddenly,” I remember the phrase from one of the -wise books that essentially says there is no such thing as all of a sudden behavior. So I thought, what is different? Well, she recently turned three. Is there something with girls and age three that turns them emotional? Age is always a consideration. There are certain ages and stages that bring out certain behaviors. But this was so drastic I didn’t think I could really blame it on a developmental thing. It isn’t teeth. She has all of those. It isn’t sickness. She has a mild cold, and that can make you cranky, but she has had much worse and been much better. There was my answer. It was her lack of routine. Kaitlyn does well for a day or two off her routine, but she can’t be late for naps, missing naps, late for bed, and absent for independent play consistently without backlash. Obviously. So it was time to get super consistent with her sleep and independent play. We have had our fun, and the weather will overall be nice for at least 6 months (I hope). Time to get disciplined again. Then Kaitlyn turned back into my sweetie. So when things “suddenly” go wrong, take a look at your life. What has changed? Therein lies your answer. Try getting things back the way they were before things went wrong before you start messing with nap times, waketime lengths, and discipline methods. It is a simple fix and often very effective. Next Post If you did blanket time, how long of consistent practice did it take for baby to do it well? EXACTLY! Our son moved classrooms at school and it was not fun for the transition time. He does super well with routines and consistency. Once he knew the new routine he got much better. It was rough in the evenings for us until he got it figured out. It's like you were reading my mind. I was trying to find time to search your blog for a suggestion and here it is! My two year old has been SCREAMING through nap time for a week now. Two weeks ago we moved nap back a little so that we could play outside in the nice weather. Now I see tha thas come back to get me because he refuses to nap. We're on day 3 of putting him down at the old time, even if he does scream for an hour. I am hoping it doesn't take too much longer for him to readjust back to the old schedule and quit screaming. i'm with ashley! i'm at my wits end with getting my 3 month old to nap- the last week he has been putting up a fight with anything, of course, this may just be a baby phase that i know nothing about. regardless, he had been napping, and now, no matter what i do, it's a scream fest. i've been trying to gradually extend his waketime as bw suggests, since i am working on getting ready to drop the late evening feeding, and drop one of his naps- and i'm hoping this is just an adjustment period. it's good to know that it isn't always just you though. thanks! My daughter recently turned 1 and 'suddenly' she is not napping well! Today is the third day this has been going on. I have tried to identify what is different in our schedule but honestly nothing has changed. Before this I would always put her in her crib, say goodnight, kiss her and leave her. She'd normally sleep within 10 minutes. But now, the minute I put her down, she starts to scream. I have never done CIO and am hesitant to start now. Especially since I don't know why this is happening. Could it be separation anxiety? She never went trough it before. Or maybe teething? She's eating as usual. Right now I am rocking her to sleep. And if I put her down before she falls asleep she starts crying. once she's asleep I put her down but in 40-45 minutes she'll wake up crying again! I have no idea what to do! Please help. Loges, I am not really sure. If nothing has changed for sure, then look at what should change. See the blog index under "sleep" or the blog label "sleep problems" for ideas.My guess would be that there is some sort of pain or something; however, if her behavior is normal during the day, then it might just be that she wants to have you stick around longer. Sabrina,lol…barnacle on belugaOkay, we have had a similar situation. What we did is had my parents come and watch our kids and put them to bed at bedtime. So my first advice would be to have someone watch your three month old if possible.If that is not an option, my next attempt would be to bring a packNplay or a PeaPod (ever heard of it, I just got one!) or bassinet or something and find a room to put the baby down to bed in at the church. When it is time to go home, get baby up and go home and put baby to bed.If that isn't possible, I would allow for longer naps if possible Wednesday as well as longer sleep on Thursday. I wouldn't let baby sleep in two hours. Maybe 30 minutes. And you might need shorter waketimes all day Thursday with slightly longer naps. I wouldn't want things so off that bedtime wasn't able to be at the same time as usual.Good luck! Thanks so much for your advice! Last night I did get him to go to sleep at the church around 8 (in a swing, but it was better than nothing). I can't really shorten his waketimes because of having to drop off and pick up big siblings from school and other activities, but I was able to lengthen his afternoon nap. We'll keep working, and eventually get it all figured out. And as kid number three, he's just gonna have to fit into the pre-existing family schedule. Sometimes that is really tricky! Ings, there is a post called 5-8 Month Sleep disruptions that can give you clues.It is possible the dreafeed is causing this. I think one way to test that is to not do the dreamfeed and see if he still wakes at that time.But also, all babies (BW or not) will start to wake in the early morning hours around this age, talk to themselves some, and go back to sleep. So it might be a normal developmental thing. It can take a couple of weeks for something to catch up to them, also. So it can take a couple of weeks before you know the 4 hour schedule was premature. So that is a possibility here. Good luck figuring it out! My 17 months old baby girl has been a great sleeper from the beginning thanks to BabyWise. She slept absolutely perfect between 9-12 months. However, after 12 months I started noticing that she woke up more often during the night. I didn't make a fuss about it because she slept good most nights. Many times she woke up around the time when I used to dreamfeed her in the beginning. Do you think it could have anything to do with that? Anyway, right now the nights when she doesn't wake up at least once are getting more rare… She's teething now, but this has been going on for a while. Naps are very good most of the time, sometimes wakes up halftime, but I can make her fall asleep again. When she wakes up at night (usually between 9 and 11 pm) she's pretty devastated and seems frightened, which has made me wonder about nightmares. Sometimes she asks for her teddy which she can't find in the bed, but that never happened before… I'm not off schedule or anything and she sleeps 1,5 or 2 hours for her naps. I'm just confused. Why is she waking up?! Any ideas? We're having our second baby in a couple of weeks, so would like to have a girl who sleeps well… :)Thank you for your blog! Rebecca,I think nightmares are a possiblitity. I don't think it is because of the dreamfeeding time. For nightmares,they can happen when the child is too hot or too cold. It can also be caused by air blowing on the child.It can also be exposure to scary things (scary to her) in the day. Or from being too tired when going to bed. Or from a too hyped-up bedtime routine. If I were you, I would keep a detailed log about her day and nights for a while to see if you can find a pattern. Track what she wore to bed, what time bed happened, activities in the day, etc. Also, she could have woken up one time for a legitimate reason one time, but then came to enjoy you visiting her in the night and is just continuing to get those visits. My oldest would totally do that if given the chance. So consider that, also. Hi, im a new young mother trying my hardest at implementing the Babywise program. He seems to sleep very well at night but its during the day, i feel like its a battle. Also, i feel like i cant go out in public with him because it seems he just instantly starts to cry : ( . I hate this because people are always asking me to bring him and i just laugh. He is 9 weeks going on 10. He is formula fed as well. HELP!? *im not sure if this is the right place to ask this question. If you have answered this else where please just direct me there, there are so many posts. The Playpen, there is a post "Naps: Troubleshooting" http://babywisemom.blogspot.com/2009/12/naps-troubleshooting-revised-and.htmlSee also the naps blog index for more posts: https://www.babywisemom.com/2009/12/index-naps.htmlIf he naps in the day, that should help his crying. But he could also be crying because of you being stressed or some medical condition like reflux. Hi, I was wondering if you have any suggestions for me with my 4 1/2 month old son. He has been sleeping on his belly, basically for the last two months because I jsut cannot get him to sleep well on his back. However, even while using a sleep positioner he is waking himself up by turning over onto his back where he will SCREAM for over an hour. Any suggestions here? Should I just start him on his back and hope we have a breakthrough with him sleeping that way or just deal with this constant sleep disruption? Also, he is on a 3 1/2 hour schedule right now, I have dropped his dreamfeed, but no matter when I give him his last feeding of the day, he still wakes up at exactly 5:14 every morning. I have tried CIO for over a week and he literally screams for 2 hours. I do not know what to do. I do NOT want to do a early morning feeding, as basically I feel this is going backwards and adding a nighttime feeding. I really need some help. I'm going out of my mind! Dueck Family,I have a post called Nap Disruptions: Rolling, Standing, Crawling, etc. that should be of help you.For the early waking, I have a post called "Early Morning Feedings before Waketime" that should help with that. Good luck! What has changed? If nothing changed at all, is there something that needs to change, like moving the nap to start a bit later. Or is there a sickness or something? I would actually go back a bit with waketime. So they go down at 9 and sleep at most 1.5 hours, so they are up by 10:30, then going down again at 1–2.5 hours later. Most babies this age do best with around 2 hours awake time before the first and second nap. I would try that for a while and see if that fixes things. I'm not sure if this is where I should comment or not, but I need some advice! My 10-month-old is consistently waking up only 45 minutes into his afternoon nap crying. He sleeps through the night, going to bed awake at 7:30-8 p.m. and waking up about 7:30-8 a.m. His morning nap is usually about 1.5-2 hours. I've tried putting him down a little earlier, a little later, feeding him again right before I put him down, doing less activities during his waketime, doing more activities, having a wind-down period…Everything I can think of. He's been doing this for about a month now, though. I can't really think of anything that's changed in his routine that would affect this one particular naptime, but this interference leaves him exhausted and cranky by his bedtime. I have NO IDEA what to do. If he were waking up happy I'd think maybe he doesn't need the nap anymore, but he's waking up bawling. Most of the time, when I go in there, he'll stop crying, like he just wants to get up. He won't go back to sleep, and if I leave him in there after covering all my bases, he'll start bawling again. He's had trouble with the 45-minute intruder for a long time, but until now I've been able to identify a culprit and resolve the issue. This time is different.He just got two top teeth in recently, but they are through the gums and shouldn't be bothering him now. He is crawling now and cruising. Is he just too alert and active now? How do I help him still get his naps in even though he's excited about these new skills he's developed? I am so thankful for Babywise, and this blog has been very helpful as I (attempt) to implement it with my first! :)My son is 7months old and was been extremely content and happy up until about 1.5 months ago. He was sleeping 11.5-12hrs at night (dropped his dream feed like a champ at about 4.5months) and taking three good naps (2 of which were 2hrs or more) each day. He started waking early (5or6am…instead of normal 7) at about 5.5months. This lasted 4-5weeks as I tried to figure out if he was really hungry. We are struggling with solids so I wondered if that played a role as well. He continued to nap and go down for bed and naps well during this time. Then, a week ago he started getting SUPER fussy and clingy, crying almost every time he sees me and I am not holding him. We spent the week at my in-laws and he struggled napping there, and now that we are back home he is struggling going down at night (something he has NEVER done), as well as waking early from naps, and still getting up early in the am sometimes. He had a cold that lingered for 2-3weeks during this time, he is cutting teeth, and I'm sure he is thrown off from our week away from home, but I don't know how to address this. I'm still nursing him 5 or 6 times a day (about 3hr schedule) so maybe that needs to change? I don't even know our routine anymore, and it is not going well for baby or mom! Do you have any advice for how to get back into schedule/how to survive this season? Will my content, happy, baby ever return!? :)Thank you! He can definitely return. Is he teething? Ear infection?If he doesn't have anything wrong, I would try out the 4 hour schedule and see of that helps. My 8 month old used to go down for a nap awake with no problems and sleep 1.5-2 hours. A couple of weeks ago she got sick and since then nap time has been rough. She cries immediately when put in her crib. She often wakes up between sleep cycles and cries as well. She never did this before. Tried CIO with no success. Have changed her wake times, no change. 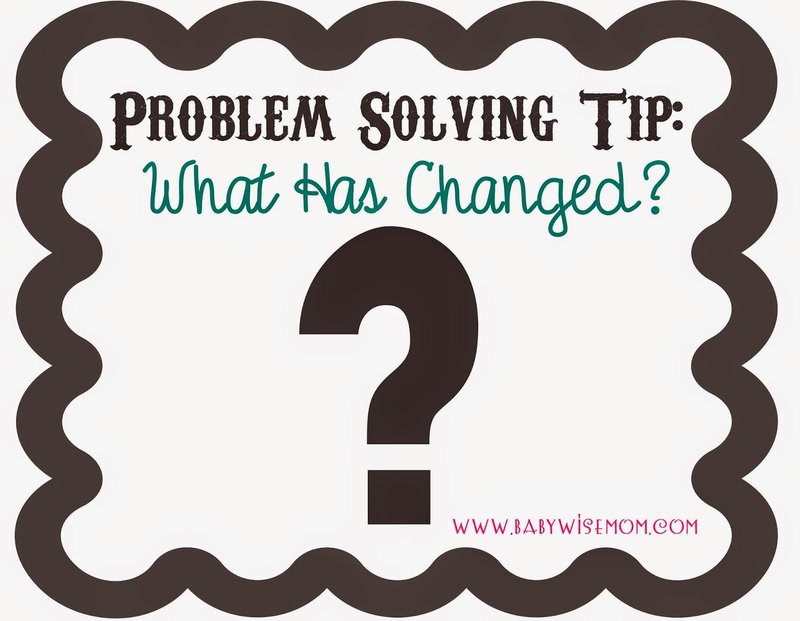 We have had the same routine in place and I can't think of any other major changes. Any suggestions?